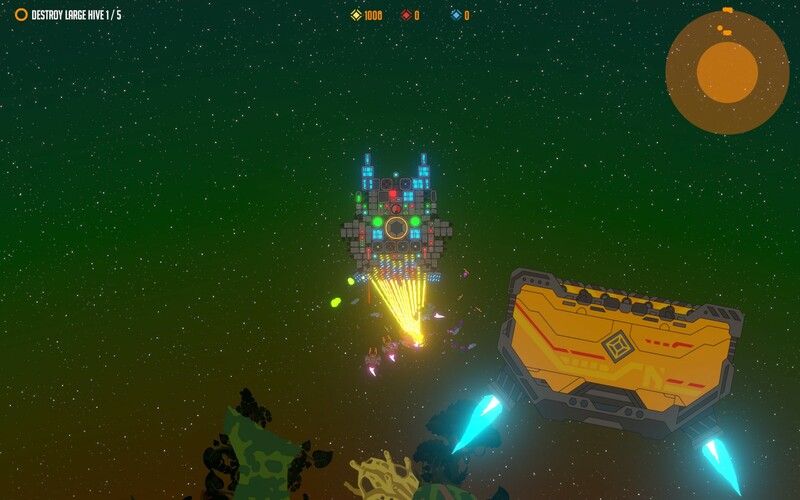 Nimbatus is an early access game where you’ll be able to build drones using a huge amount of components at your disposal. You can design anything you want in this game, just keep your mind on the physics and it will work. 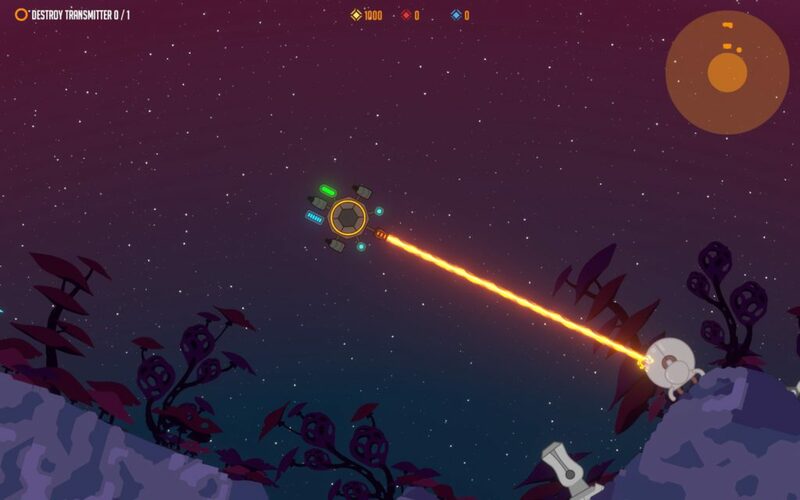 You will explore the galaxy, put your drones to work in missions, fight alien monsters, and even fight other people’s drones! This game has been developed and published by Stray Fawn Studio. Nimbatus doesn’t have much of a story. You travel between galaxies, visiting several planets, to solve problems. For these problems you’ll build drones. The game tells a bit of a story during loading screens: the Nimbatus is a mobile drone factory, sent out to space to explore. The graphics have a nice cel-shaded cartoon-ish look. The game is pretty colorful, and the alien planets have interesting elements like strange looking vegetation. The drones themselves are completely two-dimensional: all the elements are laid out next to each other. You’ll be able to see each separate element as your drone moves around, which makes it easy to see what breaks as well. The visual effects when enemies get shot and get hurt are clear, but it’s still hard to determine how much damage you do (so how long it will take to kill something), since there aren’t any health bars. You can actually destroy all of the planets you’ll visit to do your mission, which is pretty cool. The music in this game is quite relaxing. Most of the music you’ll hear is in the workshop, when you are constructing your drone. This is very chill and non-obtrusive electronic music. Whenever you enter a mission area at a planet, the music changes and becomes a bit more ominous. The sound effects of the drones and enemies are fitting to their actions. You’ll also be able to hear enemies approach before you will be able to see them, this is very useful to be able to move away to dodge enemies in time. 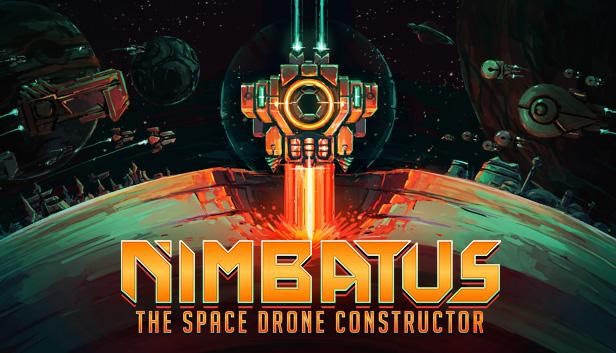 Nimbatus is a drone construction simulation game. This is not an easy game. There are a lot of materials to work with, and while the basics are easy enough, the actual mission will quickly teach you that you’ve probably overlooked a LOT of practical problems with your drone. Building a drone is really intimidating when you’re starting out. The options are endless. There’s no limit to what parts you can use, how big you make your drone, etc. Of course you’ll need to balance out fuel and energy consumption and generation, but it doesn’t matter whether you do that with four parts or with 400. You can build insanely cool and complicated machines for even the most basic task, if you want to. Keep in mind that bigger is also much harder to move around and to maneuver, but really, there is no limit to how crazy your drone can get. There’s a tutorial learning you the basics about the components you’ll work with, but when you start the real game, you’ll quickly notice you’re still woefully unprepared. Even moving around is hard: at first you’ll probably forget it’s handy to be able to move backwards as well, and once you install backward thrusters and bind those to the right keys, you’ll usually still struggle with moving around smoothly and still get stuck on random parts of the planet you’re visiting to perform your mission. 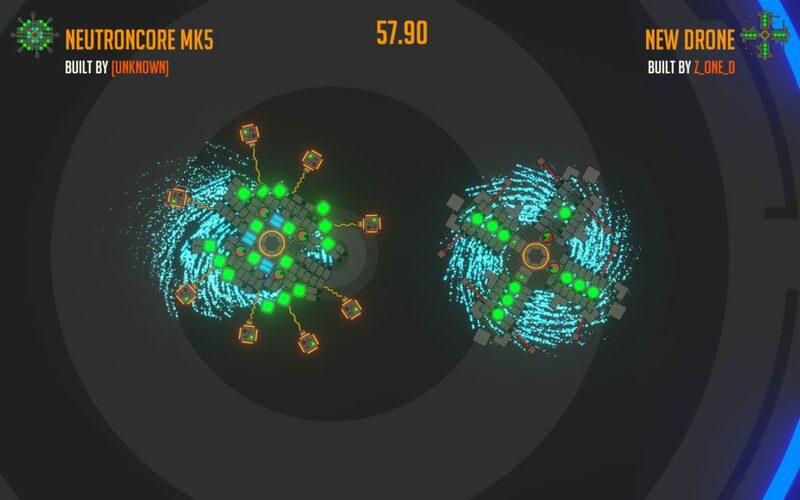 You’ll need fuel for thrusters and energy for weapons, so you’ll need both tanks and batteries. Both regenerate fuel or energy at a certain pace. When playing around you’ll get the hang of it fast enough, but testing the drones in missions is a whole different story. Every part you add to your drone will add weight and move around its center of gravity. It’s pretty hard to predict how adding any part will affect your maneuverability, and that’s when the workshop testing grounds come in. You’ll be able to test your drone when you are building it, in a testing room with a few fast enemies buzzing around. However, the testing ground is pretty boring, so you’ll probably just take your newly constructed drone out for missions as soon as possible. Still, expect to spend the larger part of the game in the drone workshop, testing out what works, revising drones after they prove to be less than useful in a mission, try and try again. The most interesting and challenging part of the game is to build autonomous drones using the logic functions available to you, and the many sensors. The tutorial trains you for this, but most of the time you’ll probably start out with a keyboard controlled drone. However, you’ll be able to build very cool autonomous things once you get the hang of it. If you loved playing around with redstone in Minecraft and building weird and awesome automatic constructions, you’ll probably love fiddling around with the logical elements of the drones. The missions are challenging, but after completing a few they don’t feel very imaginative or novel anymore. You’ll usually need to destroy things like bug hives, alien ships, transmitters or giant snake eggs, collect items, or mine resources. As you’re shooting a way right through one of the planets, you’ll probably notice some glowy stuff sitting around. Shooting it will destroy it, exactly what happens to anything else. But if you install collectors, you can actually harvest this stuff. There’s a research tree for your workshop which enables you to upgrade weapons and other parts, and you’ll need to collect resources for this. You’ll be able to fight to drones of other players too, but you’ll have to build an automated drone for this, one without weapons. You’ll need to push the other drone out of an arena, which consists of concentric rings, with the outer ring shrinking and pausing and shrinking again as the time of the match runs out. This task is rather different than the missions, but also fun and challenging to build a drone for. It’s pretty hard to build something that will win, though. The best strategy is to download something made by another user, and see why that design wins, and how it works exactly. With that knowledge you’ll be able to make your own construction more easily. 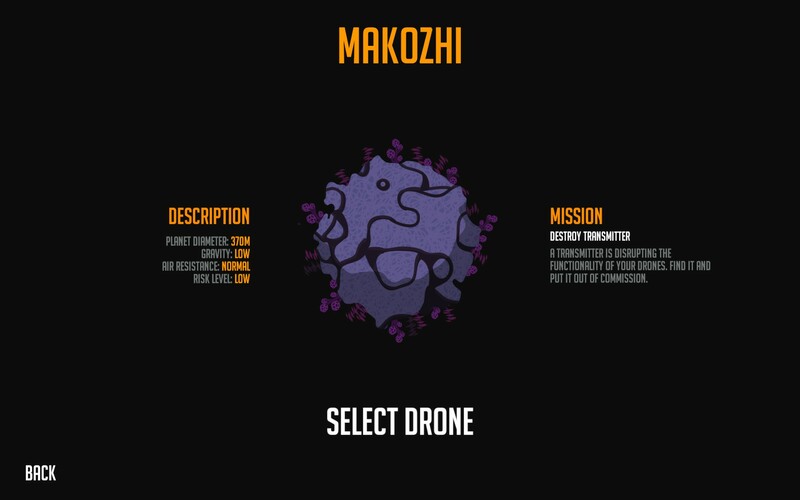 There are many awesome drones created by other players available to download in the workshop. Most are not that handy, but impressive constructions which look really cool. However, there are countless very useful drones as well, which can help you on your way to improve your own design. There are also super overpowered drones available which will immediately destroy a whole planet when unleashed upon a mission, so this is a very easy way to win a frustrating mission! Nimbatus is a great and challenging game for people who love to fiddle around endlessly with many different parts, build things from scratch, and be creative with the multitude of tools they have at their disposal. However, if you don’t enjoy the design process in the workshop that much and you’d rather just kill some aliens with a cool looking ship, you’d better buy a space shooter. 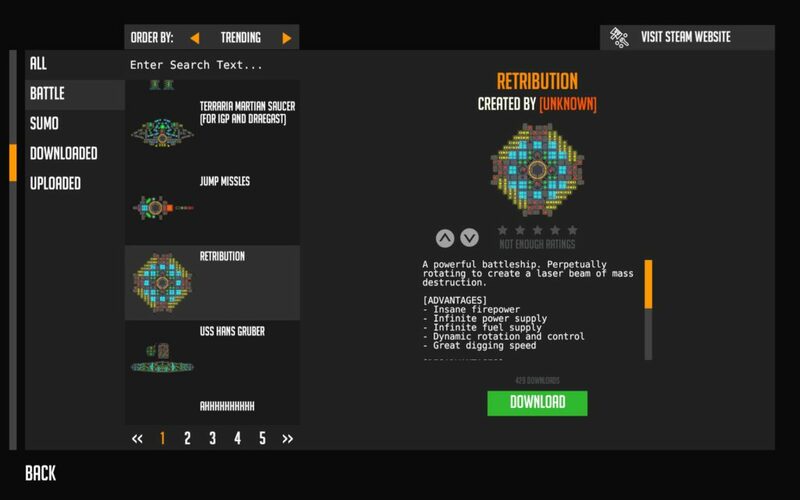 The missions are challenging at first, but they get a bit repetitive after a while. It is very cool to make an overpowered or really cool looking functional drone, but currently there is not a lot of incentive to play this game for a longer period of time.